Find your inner peace through the relaxing layouts of this beautifully crafted mahjongg solitaire game. 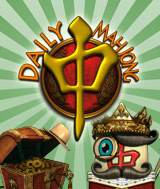 Reveal your daily fortune through the joy of three creative layouts in Fortune mode or escape the noise with over 600+ layouts awaiting your clicks in Fame mode. With over 40 custom tiles, symbols, backgrounds, music and holiday themes you won't get board as you journey to serenity. Comments: There are lots of designs, backgrounds, and two game modes. The graphics are just ok but i like change and this one has some nice ones. Add it to your MahJong group like i do since i like to swirxh around sometimes.